Back in August my mother in law ordered some saffron crocus bulbs after I excitedly pointed them out to her on the internet. She divided the bulbs between herself, her daughter and me. I planted them up in September and during our recent house move I noticed that there were green shoots coming through. 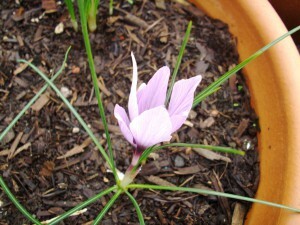 I have been checking on the shoots and in the last couple of days the crocuses started to appear. Saffron is meant to be harvested early in the morning as the flowers begin to open, so each morning I have crawled out of bed, put on my dressing gown and wellies and wandered out to check on the buds. This morning I found one beginning to open. Armed with my scissors and a tissue I carefully separated the petals to get to the red stigmas and snipped them off, leaving the pretty lilac flower. 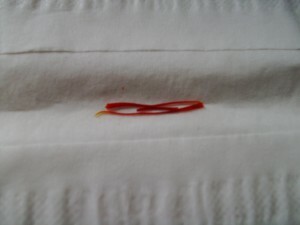 The saffron strands are drying in my kitchen and I hope to be able to collect some more tomorrow as there are a few more flowers that look ready to open. The crocuses were surprisingly easy to grow. I planted them in pots because we were moving house and I didn’t want to leave them behind. They are to be planted quite deep and well spaced, so I have 3-4 bulbs each in large bowl shaped pots that I used to grow salad during the summer. I planted them, watered them in well and then left them completely to themselves. We have had a fair amount of rain so I haven’t needed to water them, and they are growing happily without needing any attention. The bulbs are said to multiply quite rapidly so I should have an even better crop next year.